Alright I am pretty much never doing this again because The Hermetic Hour runs from 11pm my time to midnight, and I chugged an entire pot of coffee before the program to be awake enough to do the program and I think it showed. Also I wish I had touched base better beforehand. Poke and I had exchanged emails a bit but I probably could have put better notes together on the topic. So, if you want, you can listen to the episode here. Why was the show a pileup/can you explain the demarcations? The Pennsylvania Dutch break down into two camps: Modern Pagans (Urglaawe) and Christians. Within the Christian camp, there’s braucherei (good magic), hexerai (more pagan-ish magic), and regular old Christians. The Pagan camp is the newest camp. The only difference is the pagan camp seems to tolerate all magic while the Christian camp seems to constantly trying to decide what’s Christian, Tolerable, and Forbidden. Again, not going to claim any sort of personal, family tradition insight here. I invited Rob on because I wanted the other side of that coin. I cannot speak authoritatively on Urglaawe. I absolutely cannot discuss with any authority or even insight to the Uglaawe individual practice. The group practice strikes me as Wicca or Asatru but I remain an outsider looking in. The individual practice is what interests me at this point in time. To quote Rob (who is in turn quoting Amy): “Looking at paganism and trying to find your path is like looking at a tree, Urglawee for me, is looking at the roots, finding where all those leaves came from, the base, the down and dirty part that gives nutrients to the entire thing.” The original, individual practice paved the way to the modern pagan revival, which is a different and unique product from the churchgoers in Kutztown. Quite simply it’s not ceremonial magic because ceremonial magic is “I believe this how this works therefor I should conduct this experiment or ritual in this way” and folk magic is “Mín þéodisc geléafa” (whatever my community believes). This is not an excuse for scientific ignorance. This is totally why most “energy drinks” are bright, fluorescent and offensive colors – and it works! No and I only recently went to one of their events. I am interested in the Pennsylvania Dutch from a hereditary perspective but beyond my grandfather being what I previously thought was a Psalmist and a Mason, we never inherited the folk beliefs. We did have what I eventually figured out might have been a himmelsbrief, but it could have easily come with the farmhouse (or simply been purchased as kitsch from well before). I suspect my grandfather did have a relationship with the PA Dutch community but we did not grow up self identifying as such. In fact, the only time we heard the language was when they ran out of cursewords in English. I would love to engage it as an individual practice however. Is Urglaawe really the original tradition? Yes and no. The word has precedent, but I’m under no illusions that this is what the Dutch were practicing when they came to America in a community context. If you’re OK with what amounts to Wicca viewed through an amazingly well researched Pennsylvania Dutch lens, Urglaawe is cool. If you’re looking for authentic, it’s not. Talking to people after the program and after the open ritual it became clear that Urglaawe to the Pennsylvania Dutch what the Shrine Masons (or the OTO) are to Islam. The authenticity lays in the Christianity portion of it. The PA Dutch are Christians with folk beliefs and like all the other Christians, they argue over what to include in their church. Yes, there are many, many authentic elements due to the quality of the research. No, you would not fit in with the Dutch community to the best of my knowledge with a bunch of germanic runes. What this means is the individual practice would actually have authenticity to it as a personal magical system. The original group worship would have been going to Christian Church like everyone else. The modern group worship for Urglaawe is very much like any other modern theodish pagan open. (Bear in mind the disclaimer at the top). Whats the Long Lost Friend? I have a very hard time putting the Long Lost Friend into authentic, PA Dutch hands. I totally believe that Hohman did publish something which documented some folks beliefs and practices, and I believe he was interested in helping people. I do not believe it is a standard. However, it’s not magic unto itself. It’s not even really kabalah. It doesn’t have any philosophy in it. It does belong in the same genre as the Havamal. Good portions of it are absolutely truthful. If you’ve seen The Revenant, notice the scene at the beginning where the trapper pours shot into his mouth. This isn’t because he likes the taste of lead (it’s sweet! ), it’s because getting the shot wet was a known way of not only lubricating the bore but also produced a wad from the fouling and powder. I shot a stupid amount of flintlock in my 20s (and still hunt with one during primitive season) and the practice does improve accuracy. The recipe in the Long Lost Friend actually does work – blood coagulates and forms a thick patch when it hits black powder. Similarly, drinking a birds blood really does clean up the lungs too – because it dehydrates you. However, Donkeys and Doves seem weirdly specific (until you consider most Dutch folk had these animals as a common livestock or barn accessory). But that’s science, not magic, but it might have seemed like magic to most people. To that end, when Poke put me on about the kabalah I couldn’t comfortably answer the question either. It’s not a grimoire – it’s not supposed to be self referential and it’s not espousing a system. There’s no philosophy in it – no-one wonders why it works in the texts except for some strange references to American Indian beliefs and Egyptians. It’s supposed to reference what works. If there’s magic in it, it’s because the Psalms themselves are in the groove from years of use to those ends, it’s because the Psalms are one of the most popular books included in pocket editions of the Bible (remember, printed materials were expensive as heck back then), and it works on the simple raw inspiration of belief when all the other stuff in the book seemed to work too. Yes, it’s magic. No, it’s not kabalah or ceremonial magic and it wouldn’t be fair to make that comparison. It’s the internal magic which sometimes happens when someone absolutely, beyond all shadows of a doubt needs or believes in something and therefor pulls off the seemingly impossible. I’ve written before that strong emotion (love, hate, desperation) makes for amazing ad hoc magic and this book belongs on that shelf. Pennsylphonin Deutsch is the common name of the dialect the community speaks. In reality it’s got more in common with Anglo-Saxon than it does German or English. And, because it’s an oral language, it was only recently committed to paper and most native speakers can’t read Buffington-Barba. One can, if they know how Buffington-Barba sought to represent the sounds in their Germanish way, passably dictate newspaper articles to someone who only speaks Deutsch. There’s new efforts to redo the orthography into something English speakers could read in order to preserve the sounds of the language. However, this is how Urglawee becomes “orgluva”. Also to that end, Deutsch in Pennsylvania has a lot of the same features as something like Switzerland where the individual valleys had their own expressions and versions of the language. Two valleys adjacent could speak to one another, but most of the time, the lingua franca was German. The reason why I believe the Long Lost Friend might actually be authentic is because the German the book is written in places correctly in Pennsylvania. Conspicuously missing is the original language which would have been used as the Holy Language, so it’s also obviously written by an outsider. Barn stars, himmelsbriefs, maypoles (nidhing poles) are all examples of devotional magic like the book of Kells or Soyga. The pole itself isn’t important, it’s the devotion required to make one and the desire for the action being more valuable than the life of a horse is what makes it work. Similarly a barn star itself is a pantacle, and the prayers (psalms) said over it while working it were more important that the colors, shapes, and icons on it. Why does it say otherwise in books? Because no-one asked how it was made or why it was made, they only asked about the obvious stuff like “why is it a pineapple”? Devotional magic is quite simply “make something with enough intent and effort to make it magical”. Churches in Europe had all the resources in the world, so their efforts are complex. Farmers simply didn’t have the tools or the resources or the time. Their work is no less magical. They just accomplished it within the context of farmers instead of masons. No-one would dare say that the mantras of a monk are somehow less holy or effective than prayers said in a Cathedral. My guess is the Long Lost Friend if it were to be used as a devotional book would have been repeated the entire week, Sunday to Sunday, or until the effect was achieved. The people who had the chops to make that effort became the braucherei. Salem did not have some weird monopoly on witches. Folk beliefs were practiced openly in Pennsylvania and other colonies. PA even had several witch trials, which were dismissed for lack of evidence. There are barn stars up in rural PA literally as old as the colonies and repainted as such because the Amish, Mennonites, and similar sects refuse to modernize. (You have not lived until you’ve almost killed some poor amish folk at dusk because they refused to put reflectors on their goddamn buggy they’re driving down the road but kudos to them for rejecting modernity). Yes they’re “Christians” but barn stars, maypoles, snake handling, augury, and all manner of sign reading are not in the Bible. The historical societies we enjoy in PA are one of the better ones. Salem did not have one. History dies not because of neglect but because of ignorance. PA enjoyed an exceedingly high quality of education from the Quakers. Salem was rougher. Modern day Salem has the pagan revival through good marketing, but the historical society is less than 100 years old. Most of the original village is simply gone. What original buildings remain are either in private hands like the House of Seven Gables, or the Historical Society purchased them. When the historical society purchased them, they moved them to township property to make way for roads and highways and such. The original building is present, but the graveyards are almost a quarter of the size. The headstones are moved around. 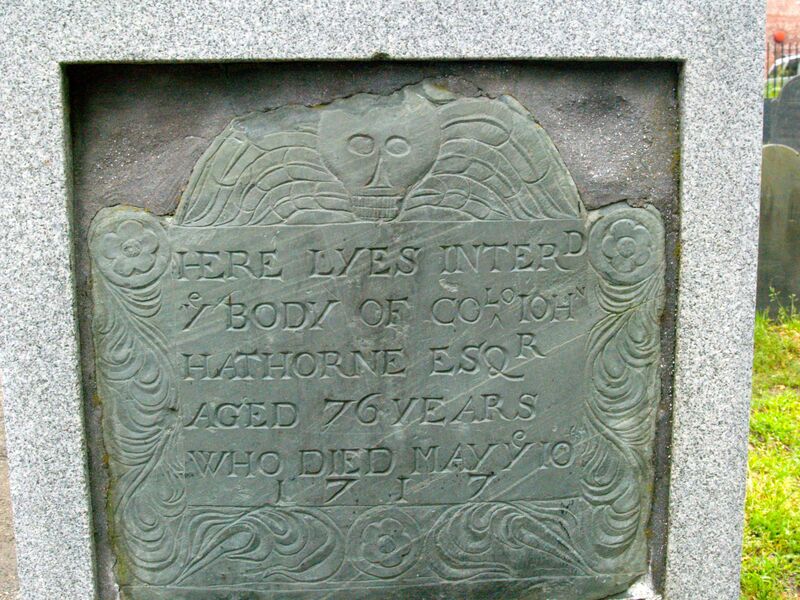 The Hawthorne headstone itself was vandalized to the point where it now sits in a stone frame and is likely not in the original location. Most of the headstones were simple to begin with and hardly readable since the famous figures had untold thousands of tourist hands make rubbings of them. The weather hadn’t been kind either and several storms literally turned up the graveyards. As such, the actual site of the hanging today is under a Walgreen’s parking lot. The address is 59 Boston Street, Salem, MA. You can visit it today but there’s literally nothing to indicate what happened there your opinion of Walgreens nonwithstanding. Gallows Hill park has a gnarly tree on top of a hill but this wasn’t the site of the hangings. The tree has been struck by lightning several times. It’s creepy, but it’s not the site, although modern day pagans still work there. The Rebecca Nurse Homestead did survive and I suggest a visit if you’re looking for a Witchy Farm experience. Also neat is the Salem Pioneer Village. Salem realized it had a problem and to drum up interest in the history they built a historically accurate village. It was supposed to be removed after the festival but the locals loved it so much they petitioned the township to save it from being destroyed. http://www.braucherei.org/ – This is good reading to talk about the individual practice. The group practice still looks a lot like Asatru or Wicca. Blanzeheilkunscht – Dutch Herbalism. I normally reach for Northern Plant Lore for my plant lore needs but I would love to stick a toe into this. One of the big problems with old world/new world plant lore is that stuff that grows in Europe doesn’t grow here. Urglaawe – the practice of Urglaawe! It’s a blog. There’s also a facebook group. Actually pretty much putting “Urglaawe” into the facebook search will surrender the entirety of the community. Pow Wow – history and excerpts. And, for anyone who wants to know about the beer recipe in the Long Lost Friend, it’s actually George Washingtons beer recipe.